Boiserie is ornate, intricately carved wood paneling, often with regard to French architecture in the 18th century. It is derived from the French word “bois,” which means wood. Early examples of boiseries (it's often used in the plural) were unpainted, but later the raised moldings were sometimes painted or gilded. They gained popularity among the French interior designers of the time, and the Palace of Versailles has many fine examples. The panels weren't confined to just the walls of a room, but were also used to decorate doors, frames, cupboards and shelves. 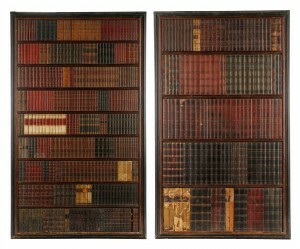 The pieces shown here (20th century American, but with a French flair) are heavy boiserie wooden library doors (or hidden doors), with a hidden bookshelf motif. Each one has stained wood framing, one door with five larger simulated shelves, a door with nine smaller simulated shelves, and fake books made from veneered wood, leather and paper (that's correct; every book on these shelves is a fake; they're also unmarked – no titles). The two pieces sold as one lot at Ahlers & Ogletree's June 25-26, 2016 estates auction in Atlanta, Ga. Sale price: $5,605.